🌟 J.K. Rowling clearly stepped up her game in the last 3 books, Order of the phoenix is still my favorite despite its huge size. But the books are much darker and mature than they started. 🌟 I like how with every book new secrets are revealed, new characters are introduced and old characters do improve. Harry Potter was so angry in book 5 but he’s more relaxed in this book. Hermione is as always the best and Ron is the cherry on top that every book needs! 🌟 The story started more quickly than usual because usually the book’s first half is introductory and funny while the second is serious and much of the things happen in that half. This was shorter than the last book so it needed to get into the story faster and since it is more of a continuation it was easy to dive directly into the story. 🌟 What really fascinates me is Rowling ability to plot, she planned things from book 1 or just magically could link them afterward. I don’t care how she does it but it is amazing. 🌟 The writing is so good & I think it is the main reason for this being maybe the best book in decades. It conveys emotion, it can be serious and funny. It is clear and easy to read. 🌟 This was immensely enjoyable and I still recommend the series for everyone. I gave it 4.25 stars out of 5 stars. My daughter who is in her late 20’s is Harry Potter mad. Books, Lego, pjs, bags, you name it she wants it . I am always SO impressed when authors link things back to the first book. Things they have to plan out is just mind blowing! I really love this cover too! I love it too but this is my first re-read because it has been ages! I had a few problems with The goblet of fire but I like that every reader has a favorite book and movie. I have those covers because I think they are the best! I love it but few authors can really do it! This is actually a re-read but the first time I am reviewing them properly! Oh, sorry then 😬 it honestly sounded like this is a fresh experience 😅 you’re exceptionally good at reviewing and giving back your first impressions then 😯 😊 Nice work! Very true. One person who is really good at it is George R.R. Martin with the Game of Thrones books. Although, he might not be as good as I thought… since I’ll never see the end of the series. haha! 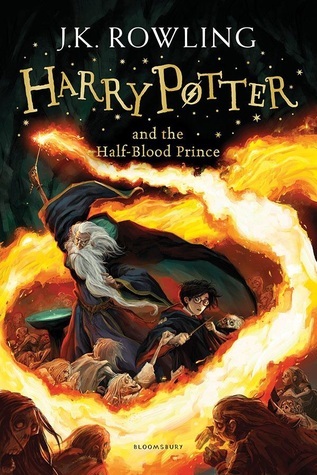 This is my least favorite HP book, I can’t remember why maybe it’s because it got much darker that the previous book. I read it so many years ago though, I need to re-read it to get a fresh view!!! Order of The Phoneix is my favourite too! Also, yes Rowling is brilliant at plotting out her stories! It has been ages and although I remember the plot, I forgot how good the writing was, or I wasn’t as much as a critical reader as I am. So it really felt like a new experience! Hahaha, Oh that is 1000% True, but I keep thinking of them more as a TV series than a book! I felt it was slow and had unnecessary scenes. It wasn’t as exciting as the other books for me! The 3 last books are indeed dark and are not even middle grade anymore. I think that I like this darkness though and I enjoyed the last 3 even more! Yes, I need to think of it that way too. I don’t know that I would want to even pick up the books at this point. The author lost the enthusiasm to write them in the first place, so nothing to feel guilty for!